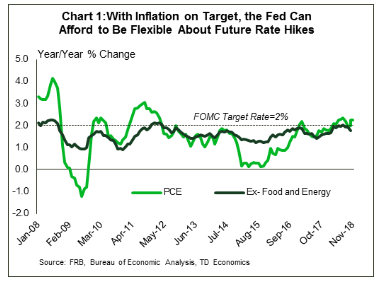 FOMC minutes released this week suggested that flexible could be the new gradual for the Fed. While a rate hike for December may be in the cards, future moves are now more dependent on the incoming economic data. President Trump and Xi are set to meet-up at the G20 summit over the weekend. Stakes are high for an agreement to be reached. If not, higher tariffs are set to kick-in come January. While cracks are starting to show in the armor of the U.S. economic expansion, there’s still plenty that’s going well. Q3 GDP growth remained solid, consumer spending is strong, income gains are healthy and inflation is contained. Yellow is the New Green? Financial markets responded to the message of Fed Chair Powell on Wednesday that the fed funds rate was “just below the broad range of estimates of…neutral,” after previously stating that it was a “long way” away. Market participants took the subtle shift in narrative as a sign that the Fed may be easing the pace of rate hikes in the New Year. 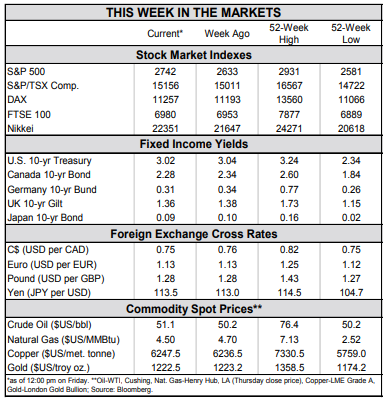 Both stock and bond markets rallied in response. In that vein, the trade tug-of-war with China continues. The hope is that negotiations go well at the G20 meetings in Buenos Aires that kicked-off Friday. The stakes are high. President Trump signaled prior to the meeting that if the two countries failed to reach an agreement favorable to the U.S., additional tariff on virtually all U.S. imports from China would be forthcoming. Such a development would exacerbate the slowdown in global growth – another risk flagged by the Fed. 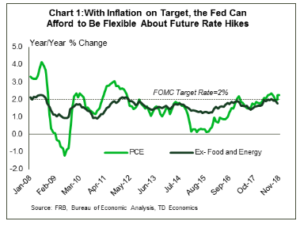 Further underscoring the concerns raised in the Fed minutes are recent economic and financial data. Signals of slowing activity are most apparent among the interest-rate-sensitive housing and auto sectors, but other indicators also showing signs deceleration. Initial jobless claims have been trending up in recent weeks, rising to a six-month high in the most recent data, while capital goods orders have also turned south, suggesting business investment growth may also be easing. Meanwhile, there are few signs of inflationary pressures. After hitting 2.0% in July, core PCE inflation fell to 1.8% in October. The recent trend is even softer, with price growth averaging just 1.2% over the past three months. The good news is that consumers are showing little sign of fatigue. Consumer spending grew robustly in October, rising 0.4% and setting the stage for a strong showing in the final quarter of this year. Holiday spending may get a further lift as households spend the extra coin left in their wallets after filling up at the gas pumps. 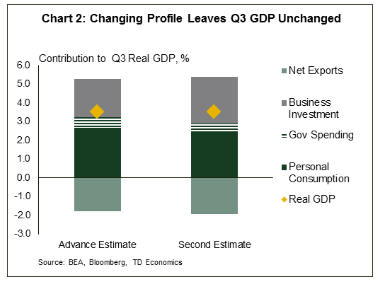 Revisions to third quarter GDP were similarly encouraging (Chart 2) with business and residential investment revised up. 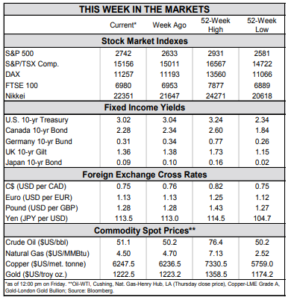 Overall, the economic data flow out of the U.S. this week was relatively balanced. Unfortunately, the downside risks to the outlook are mounting. 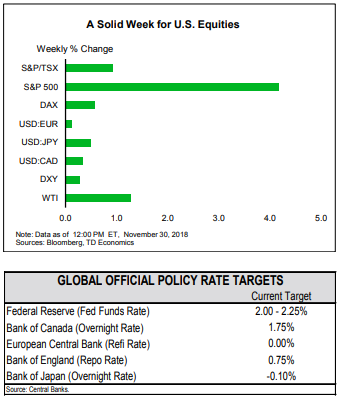 It became clearer this week that the Fed is paying more attention to these risks and the economy may not need as many rate hikes as they believed back in September. All said, yellow may become the new green for the still-global-growth-leading U.S. economy.